Common lilac (Syringa vulgaris) can grow anywhere between 8 and 20 feet tall and wide, depending on its cultivar. If it is given plenty of space, pruning may not be necessary outside of occasional deadheading and thinning. But if your lilac is planted in close quarters (now, who might have done that?) or if you otherwise wish to restrict its size, here are some methods to try. 1) Deadheading - removing spent blossoms and seedheads to visually clean it up and increase blooming potential for next year. 2) Removing or minimizing basal shoots (suckers). 3) Reducing the shrub's size to encourage lower blooms where we can more easily enjoy them. 4) Thinning the shrub to preserve its tree-like character. 5) Starting over - renovating it from the ground up. Note that some dwarf and specialty lilacs do not exhibit the same size issues or suckering, but many of these same pruning principles apply. They also work on a host of other multi-trunk shrubs. 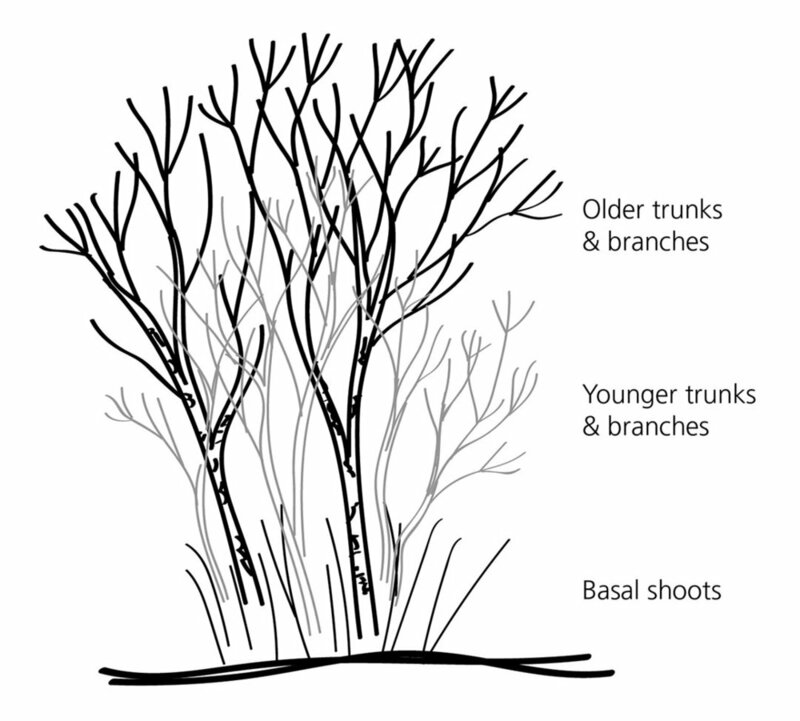 For an overview of basic pruning principles, check out our earlier post, Pruning 101. Here's an image of a moderately mature common lilac that can use a little maintenance. It has older trunks (showing the more mottled, gray bark), younger trunks (smoother, tan bark), spent blooms with seedheads, and a healthy crop of basal shoots. While it was not possible to prune this tree and take before/after photos in time for this post, we have illustrated the techniques we would use below. A medium-sized lilac shrub in need of some pruning. 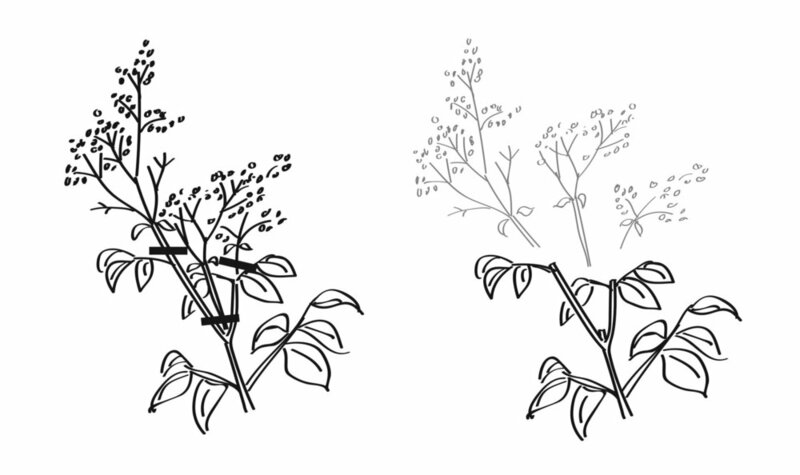 Diagram of our lilac shrub (not including leaves or flowers). Deadheading is a good starting point when you're still getting used to this whole pruning thing. It's helpful on younger plants to redirect their energy from producing seed to producing next year's flowers. It's not as necessary on older, established lilacs, not to mention a time-consuming job on a big shrub with lots of blooms. This is also true for rhododendrons. Most lilacs form conical bloom clusters on branch ends. To deadhead, cut just below where the cluster begins and, just above where there is a significant side branch or leaf node. Or, if you are reducing the shrub's size as in Option 3 below, you can cut further back to a larger side branch. The best time to deadhead is within a few weeks after blooming to give your lilac the most time to develop bloom buds for the next year. Deadheading - remove spent blooms and seedheads. The basal shoots, or "suckers" can be annoying but are a natural tendency of lilacs to form colonies. If your shrub has been left unpruned for many years, it may have formed a dense little forest of thick shoots, a bit intimidating to take on. Also, basal shoots tend to grow more aggressively a year or two after a hard pruning. So the best way to stay ahead of them is to reduce their numbers each year rather than wait every few years and then face a big job. You may choose to leave a few of the tallest new shoots to form new trunks, especially if you are reducing the shrub's size or renovating as discussed below. Removing basal shoots is a simple, but sometimes physical job. Cut them at ground level, or as low as you can reach, with well-sharpened loppers or a small hand saw. a) It might take a couple of years to reform bloom buds and bloom significantly. b) Significantly reducing the natural size of any tree or shrub can trigger aggressive new growth and create a situation where you need to maintain it more often. Try to not reduce its size too often, perhaps every five years or more. To reduce it, cut the tallest trunks with a pruning saw at ground level, or low as you can reach. You might want to remove one trunk at a time, stepping back to observe the effect after each removal. This helps prevent the removal of more than you intended. If you don't want to remove entire trunks, you can remove the tallest shoots off the main trunks. Besides reducing height, this helps thin the shrub, which is good maintenance as well. Also look to thin out problem branches, which might include dead, broken or aggressive vertical shoots growing up through the center of the shrub, which make it denser. You don't want to eliminate every last branch inside but reduce the density to allow more light and air to circulate. Reducing size - cut taller, older trunks at the ground, and thin out some taller internal branches. Many lilac shrubs over time develop a somewhat twisted, multi-branched, tree-like character with textured bark. If height is not an issue, this character can be enhanced by thinning out younger, straighter, fast-growing shoots and leaving the older ones. Then do some typical shrub thinning, which we've described more fully in Pruning 101, or Spring Pruning Part 2. Thinning & preserving character — remove younger competing trunks, and thin out some taller internal branches. If your lilac has achieved Monsterhood, or all the blooms are now twelve feet up, you might just choose to start over. As with many fast-growing, multi-trunked shrubs, lilacs will survive being cut all the way to the ground, sending up new shoots the following growing season and approaching mature height within a couple of years. Forsythia, spiraea, mock orange (Philadelphus), and shrub dogwood can also survive this method, known as coppicing. The new crop of shoots can then be thinned out to allow a few stronger ones to develop into the new structure of the shrub. In some regions, coppicing is regular practice every few years to control shrub growth. We don't recommend it on a regular basis, but it's an option for renovating your lilac. Keep in mind that, as with other size reduction techniques, it might not set flowers for a few years after being coppiced. It is best done in late winter, just before new growth starts to emerge. Renovating - remove all but a few basal shoots, or coppice (cut everything to the ground to regrow). Prune to minimize bare stubs — cut to just above a branch node or bud lest you leave an unsightly stub that will die off. It's wise (and cleaner-looking) to cut to redirect growth to a significant side branch, and away from the center of the plant. We strongly recommend this for more delicate plants such as Japanese maples, but with sprouting shrubs such as lilacs, it's not as essential. They will sprout close to wherever you cut. The same goes for sawing thicker trunks — close to a side branch or at the ground will look better, but the shrub is likely to sprout from anywhere. As with most shrubs, don't obsess with cutting every last branch that you "need" to, or making every cut perfect. I often describe pruning as "nudging" your plant toward a certain direction or behavior rather than strictly controlling it. A lilac can be a strong-willed child - better to redirect it gently and frequently, rather than try to control its future with one heavy-handed pruning session. As with all garden advice, we're happy to answer any specific questions you might have. We can even show you a quick pruning demonstration at Swansons. Send us questions via comment below, post to our Facebook page or use hashtag #heyswansons on Twitter or Instagram.